If you picked “321” a few days ago, get to your local deli for your $500. You won. But, unfortunately, someone else lost because that’s the number of days it took for Andrew Cuomo effectively to take “control” of the City’s schools out of the hands of our current mayor. Of course, Mayor de Blasio technically still “controls” the schools until June 30, 2015 but now he does so in name only. Last spring, our new mayor ran into a buzz-saw named Andrew Cuomo on a number of education policy issues. During his campaign for mayor, de Blasio advocated a tax on high income earners to fund his plan for universal pre-K in the City. Governor Cuomo disagreed. The mayor put a large pile of chips that he’d earned in his sweeping victory on his proposal. Andrew Cuomo picked up the chips and announced that he would provide funding for pre-K programs around the state through the State budget process. Andrew Cuomo is a man who doesn’t step back from a fight. A few weeks later, our mayor put a few more of his chips down on a plan that gave the go ahead for the expansion of a raft of charter schools previously approved by Mayor Bloomberg, but blocked the co-location in over-crowded public schools of three Success Academy schools run by the formidable Eva Moskowitz. Moskowitz closed her schools for a day and bused thousands of her students and their parents to Albany for a rally that was billed as a field trip to observe how State government operates. Governor Cuomo announced at the Moskowitz rally that he disagreed with the mayor, pledged his firm support for charter schools and picked up the pile of chips the mayor had put down. 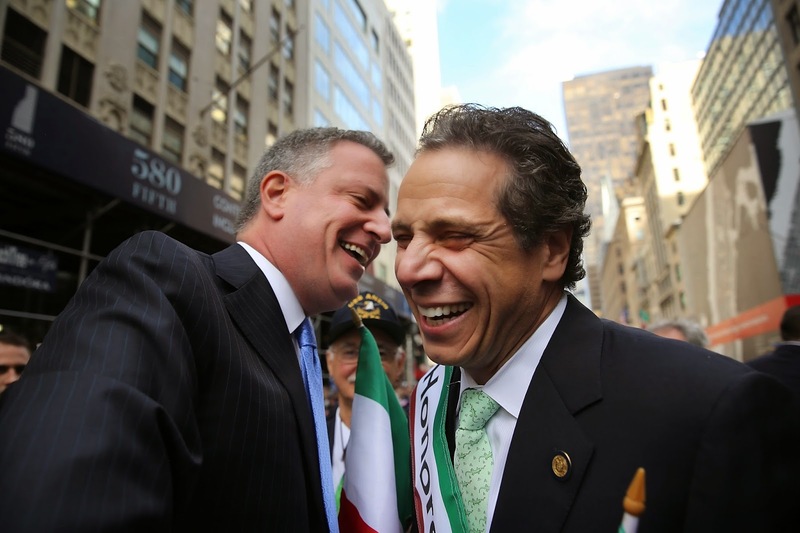 Andrew Cuomo is a man who likes putting chips that belong to other politicians into his own pocket. Last week, Cuomo’s Education Commissioner, John King, demanded that the City provide a plan for remediating 94 low-performing city schools. A few days later, the Mayor found a few more chips behind the sofa cushion in his office and announced to much fanfare a “School Renewal Program” that was hailed as a repudiation of the school-closing policies of the Bloomberg era and the beginning of a new approach that would turn troubled schools into community schools with “wraparound” social services provided by local organizations. Teachers at schools in the “Renewal” program would be required to reapply for their jobs as part of an agreement worked out with the United Federation of Teachers that puts teachers displaced from any of those schools into a gray middle zone between assigned teacher and ATR. No one thinks that Boys and Girls High School and the 93 other schools in the “Renewal” cohort work well or that every teacher who teaches in one is a genius. But the new principal at Boys and Girls was given a $25,000 bonus to take on the job for one year, with an option to return to the “school where his heart is,” while working one day a week at his old school. That new principal immediately began to do what every principal has done for twelve years: he started to pick his own students in order to “goose” his numbers by forcing those with low credit accumulation, including the president of the junior class, to transfer out of the school. But what Andrew Cuomo really cares about is breaking the union that provides the monopolist teachers who staff the last great monopoly. He wants to close those 94 schools in six months just as schools have been closed for the last twelve years rather than support them with the extra resources and services that the mayor wants to give them. The problem with those schools is not principals who don’t want to run them or a long-standing lack of support for some of the most disempowered communities in the City. Once again, it is those monopolist teachers who are to blame. Andrew Cuomo wants to make sure that the progressive mayor of New York City and its teachers union can’t “control” the schools that rightfully belong to the investment bankers and charter companies that funded Cuomo’s reelection campaign. And the truly wonderful thing for Andrew Cuomo is that he doesn’t have to do something messy like change the law that provides for mayoral control of the City’s schools. He can just take effective control out of the hands of this mayor by fiat through his complacent Board of Regents while reserving the right to give back control to some other mayor who looks more like the City’s last mayor. Mr. de Blasio, we hope you enjoyed your time “controlling” the City’s schools. But the next time you walk into Tweed to meet with “your” Chancellor be sure to bring an ID card. You’ll be asked for one. As for those last few chips you still have, hold onto them tightly and use them for something you really do control, like the Parks Department.